Children love toys, once they enter into a toy shop it is hard for parents to get them out. They will spend their sweet time exploring the new toys aisle by aisle. A sleepy child will become energetic again as soon as they step into the toy shop. More often than not, they will want to buy some toys. Not only children love toys, teenagers too..Teenages are more incline to collect toys as hobby..we have got limited choices of such hobby shop in the area we live. It would be nice to have a shop selling children toys and teenagers' hobby collector toys under one roof. Since we do not have such a shop here, toys collectors can shop hobby supplies online at HobbyShopNJ.com. They have got wide varieties of choices and categorised into age groups, from newborns to age 13 plus. Categories include electric trains, comic departments, radio control items, scouts, gaming, educational toys, sports cards & memorabilia. HobbyShop sure making online shopping easier and fun. On top of supplying toys, HobbyShop also offers a variety of birthday party themes, from Princesses to Lego themes, or any other customised theme to meet your needs. 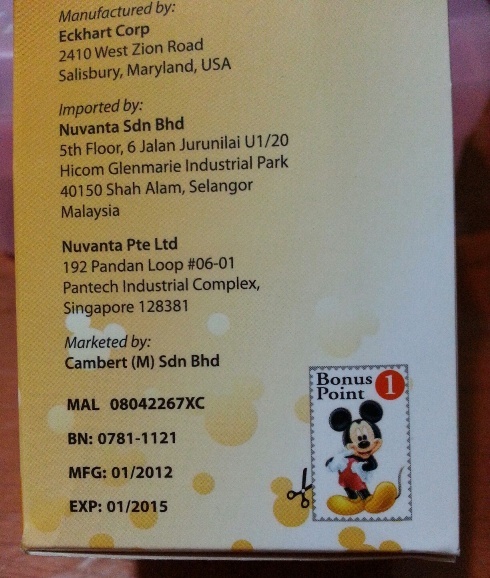 The party package is come with a $5 gift voucher for the birthday child, that is a $5 discounts on your next purchase. There are many occasions and every reasons to send gifts to our families and friends. The common problem is that we always run out of ideas of what to give, I face this kind of problem all the time when my husband leave me alone to make the decision. I could spend the whole day looking for the right gifts at the complexes and end up nothing seems to be the presentable and practical gift. More often than not, we just give an Ang Pow with money in it as gift, it is a traditional Chinese custom to give Ang pow but it does not give much of a surprise to the recipients. With the headache that I have gone through in getting a gift, I find the creative gift ideas by Bisket Baskets is a brilliant idea. They are the gift expert in all occasions including gifts for pets lovers. They were the first company to sell dog gift baskets. I am amazed to learn about this. Based on their 13 years experience in this business, I am sure they will be able to cater for individual needs should you need special arrangements for your families and friends. Vitamin C is the most common vitamin that parents give to their child as daily health supplement. I always made available Vitamin C for my girls and remind them to take their vitamin whenever I remember. As you can see my girls do not take Vitamin C consistently on a daily basis because I always forget. They help themselves with only the Spirulina. My girl caught a flu and cough these few days. Kids do have their preference on the taste of the Vitamin C they consume. My girl complains that the taste is too sweet for the existing brand that I have bought and it's almost finished. 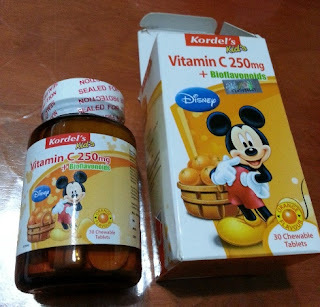 In order to replenish it and get her to consume more Vitamin C during her unwell period, I bought the over the counter Kordel's brand Vitamin C-250 this time. The packaging is very nice & cute. I have tried one tablet, the tablet size is a bit big but taste just nice, neither too sweet nor sourly. There is a 1 Bonus Point cutout on the box, I do not know what's that for, will need to find out before I throw the box away. Probably need to collect them and redeem something. 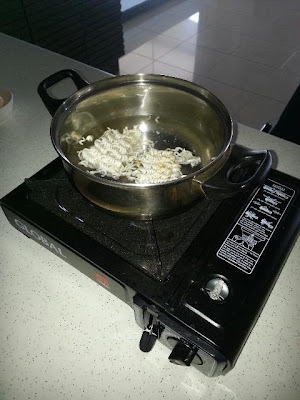 On the way sending my girls to school this morning, my stomach started rumbling. 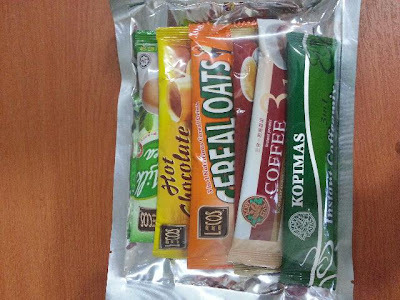 My mind started to search for a place to get my breakfast, and still the most convenient place is a little shop under the staircase in the complex where my office is, I could also get a parking space easily at the early hour. I grabbed a packet of fried meehoon and a box of nasi lemak. Usually I would eat one and leave one for my lunch. 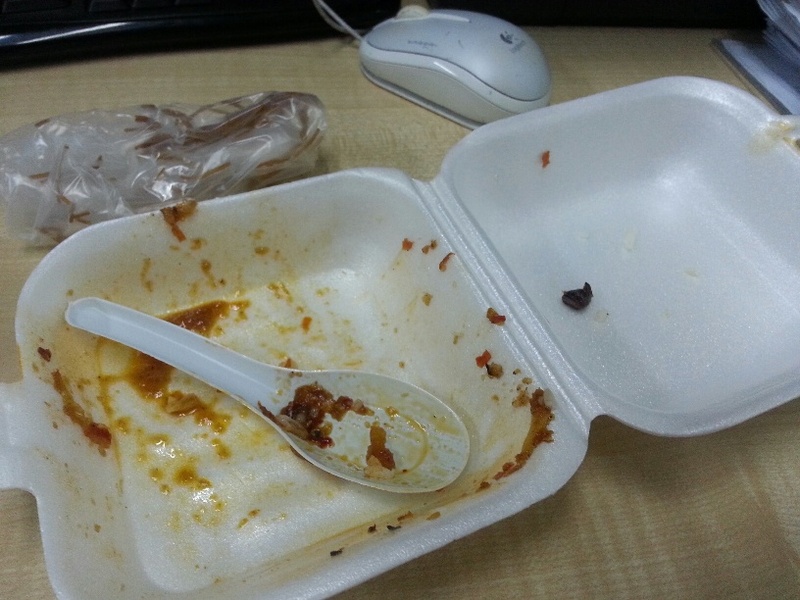 But not today, I finished both during breakfast. so I started my day with heavy breakfast today and soon I am feeling sleepy on my work desk, yet another sleepy day at work. 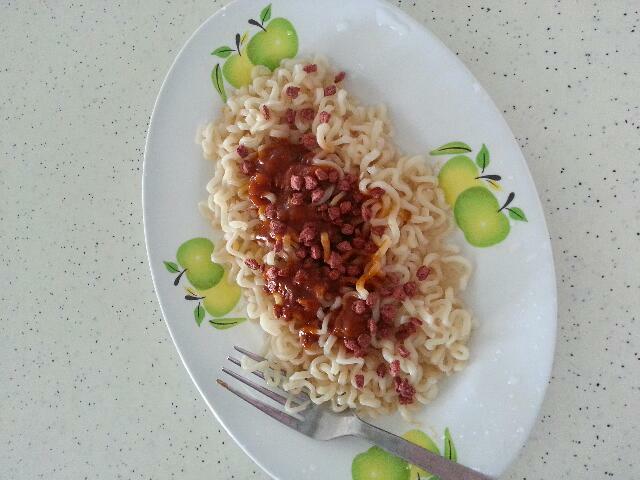 I am wondering why am I so hungry these few days? Could it be due to the additional vitamins I started to consume recently? Breakfast is the most important meal of the day, I really do not mind having heavy breakfast, preferably a healthier ones, and a lighter lunch. Age is catching up and couple with prolong lack of sleep, stress at work and many other stuff that keeping me busy and stress out, I get fatigue very easily nowadays..I hardly take any nap during lunch hours but now I do..I feel myself half asleep when I am at work, my boss will sure give me a warning if she knows I do my work with my eyes half closed, "_". Besides trying to watch the food I consume, I also added on more vitamins supplements with the hope that they will boost up my antibody. I have not been consistent in taking my vitamins so far. 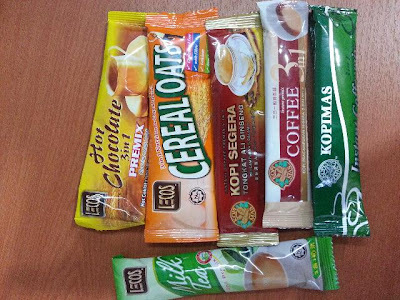 Some of them have gone expired without finishing them. What a waste of money. 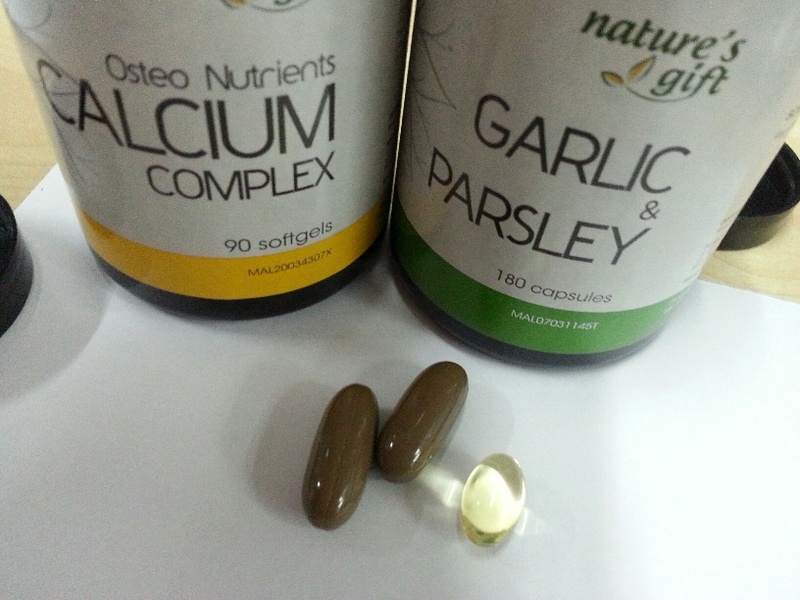 Last week, I decided to start taking Calcium Complex and Garlic & Parsley. The recommended dosage is 4 capsules of Calcium Complex (the brown one, I try out with 2 a day) and 1 capsule of Garlic & Parsley. 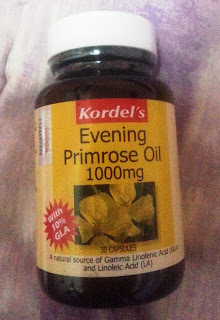 Today, I bought a bottle of Kordel's Evening Primrose Oil (EPO) to be included into my daily supplements. Are you taking any vitamins & minerals supplements? 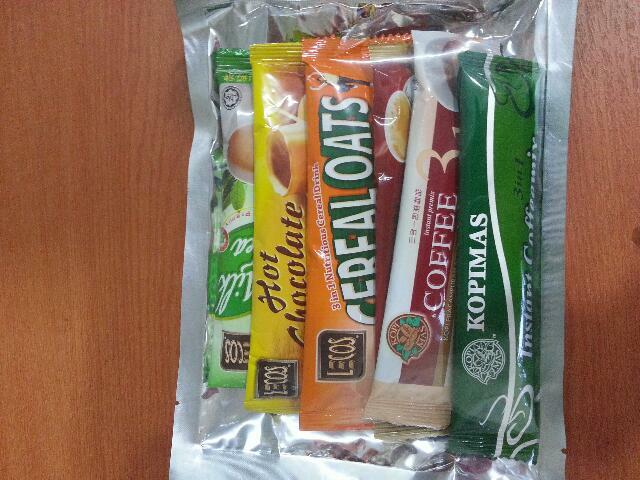 Mind to share what are your daily supplements? As non muslim, me and my colleagues are equally excited to try the Buka Puasa buffet and set menus offered by the local restaurants and hotelier. This morning, one of my colleague brought in a leaflet from a restaurant at Suria Sabah Shopping Mall which she took yesterday. She was excited with the varieties of dishes and desserts she saw on display at the restaurant. 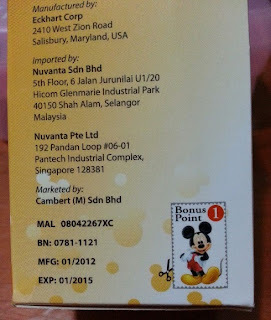 The price per adult is RM29.90++, while for the kids age 5-12 years old is RM20.90++. There is another place serving Buka Puasa set menu. It is a short drive away from the city with a nice view and cool breeze. 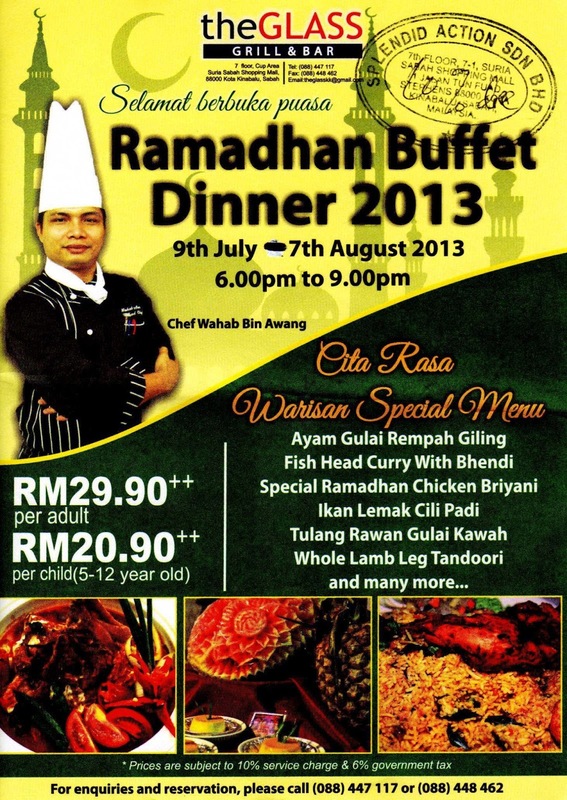 If you are around Kota Kinabalu, check out these 2 places for your choice of Buka Puasa venues. Half a year has gone!! 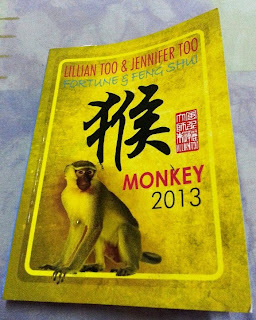 It took me half a year to open this little booklet of Feng Shui for Monkey 2013 which I bought at the beginning of the year, thought I would learn and find out ways to enhance what's good and what are the remedies can be done to block the no good stuff on the Monkeys this year. I believe the Feng Shui (things around us) does affect our daily lives to a certain degree but I have not put much afford in practicing Feng Shui in our home. I read a few pages of this booklet last night for my reading pleasure. 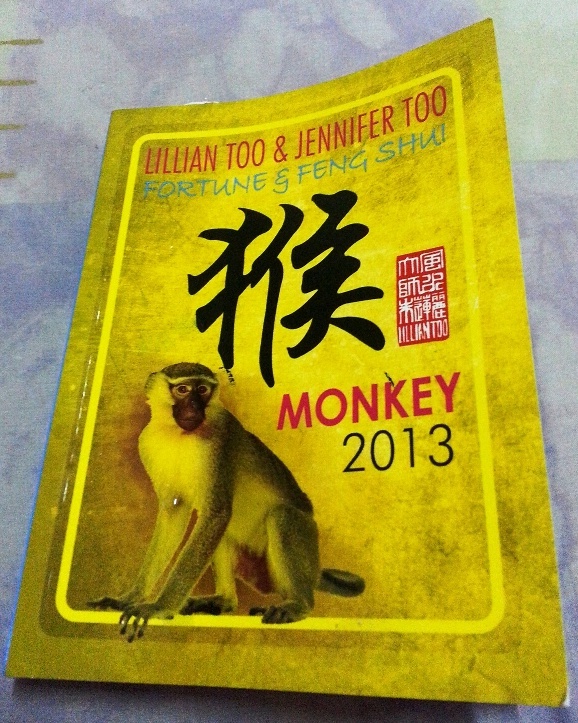 It would be a long way if one were to to practice Feng Shui by the book. 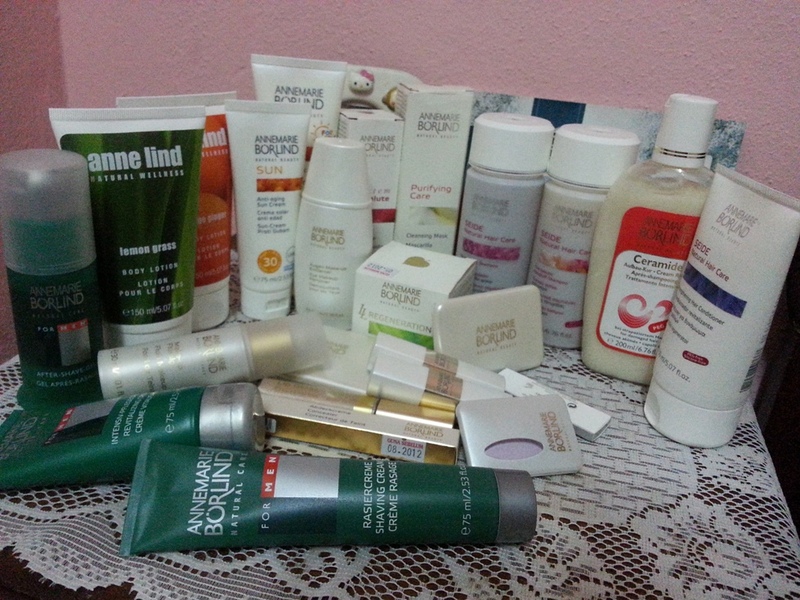 Chance to try some skin care and cosmetic products. 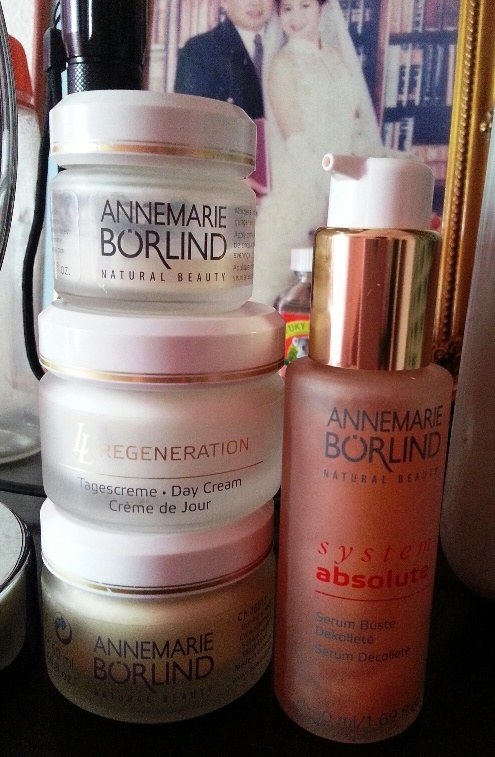 I brought back a range of skin care and cosmetic products which have to be used between 6 months to 12 months times after they are opened. It is a reputable brand which I have been using their skin care products, like Day and Night Cream, and I particularly like their eye care cream. I have also blog about it here before. These are other products that I have been wanting to try..and I am allowed to choose men's items for my hubby too..
Serum for the neck and decollete (lower neckline), I really like to use it..like the smell too.. 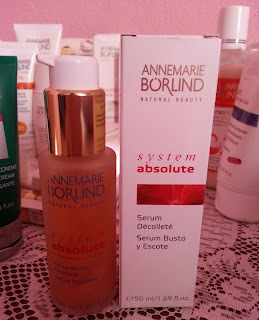 The Serum Decollete has now added into my daily skin care application, alongside with eye cream, day cream and night cream. I have skipped using toner for economical reason. 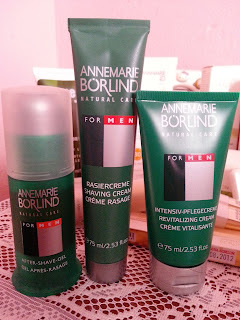 Men's products for Clet - After Shave Gel, Shaving Cream, and Revitalising Cream. He doesn't use any of such products before but doesn't mind using them now. 2 types of masks. Have not been using mask for quite sometime now. 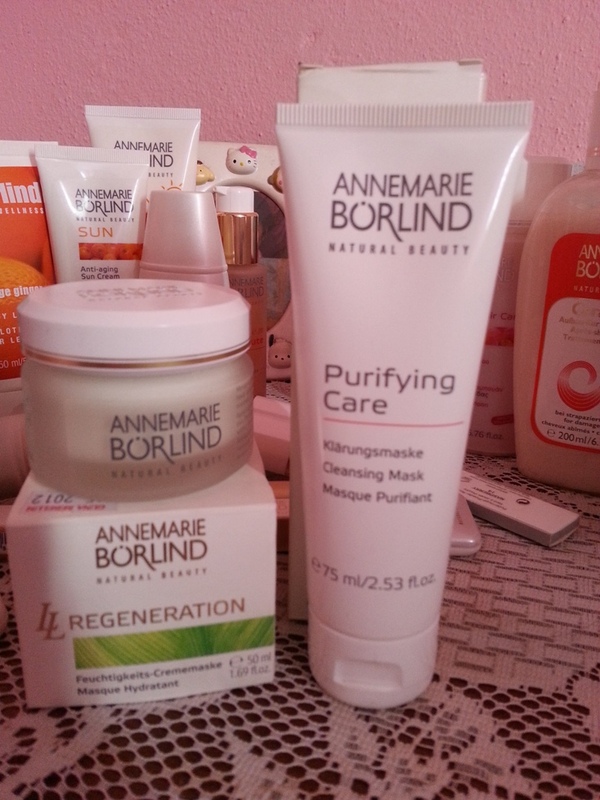 I have tried the Purifying Care Mask last Saturday. 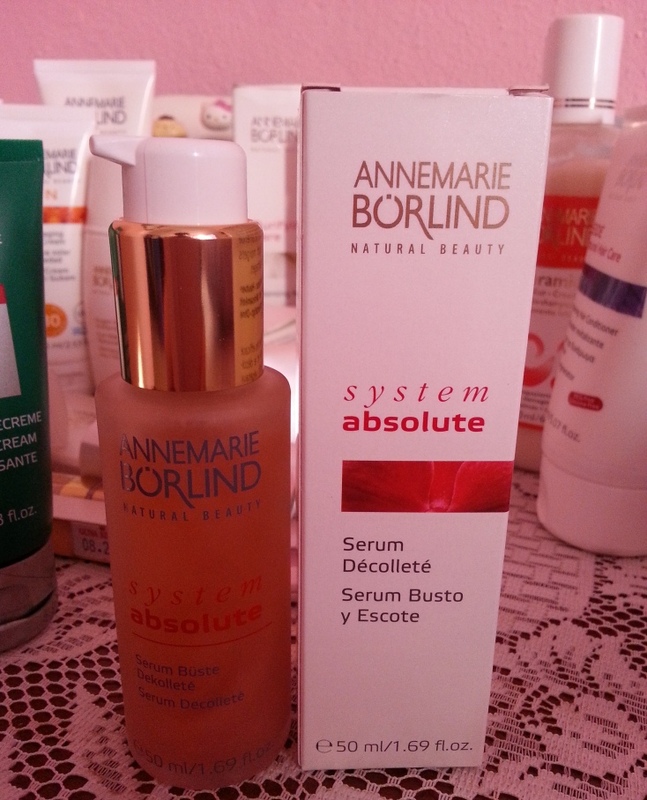 I feel my face more supple after using it. Will use it more frequently if time permits. 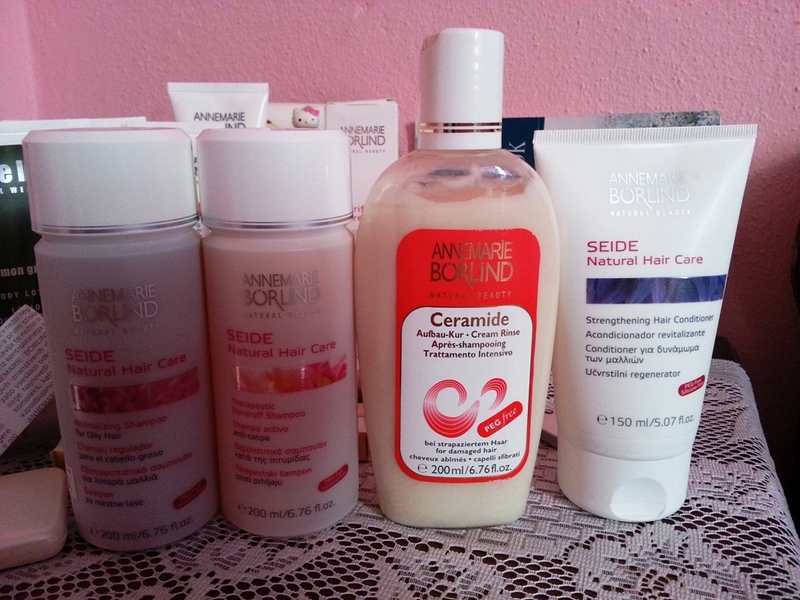 Shampoos and conditioners. Not having a nice feeling after using the Dandruff shampoo..probably due to its natural ingredients, it lacks of the smoothening agents hence drying up my hair after wash, luckily the conditioner helps to moisturise my hair a little. Now I have more lips colours to match my clothing and my mood. 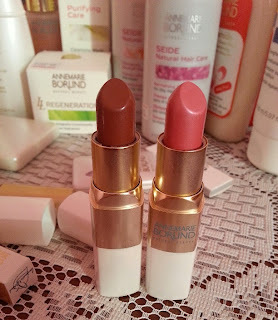 The Mocha Latte and Ice Rose, giving me a warm and cool colours selection. 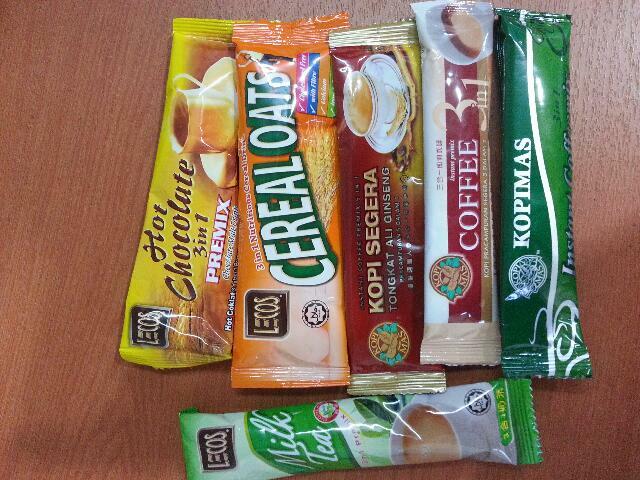 I find the Mocha Latte, which is a warm colour suites me better. Time flies. 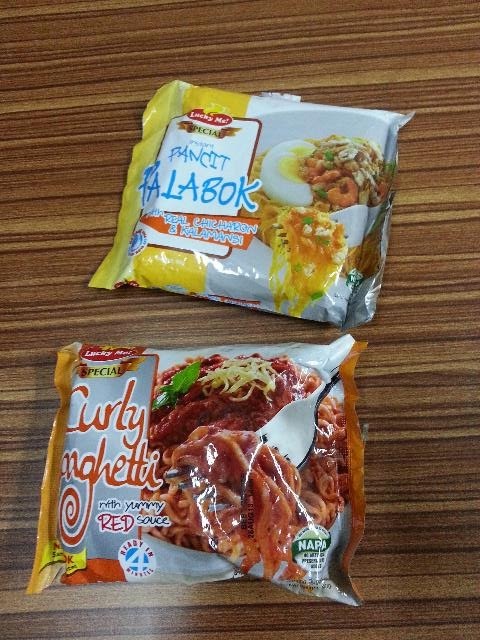 The packets of instant noodles I bought from our trip to Philippines last December have nearly gone expired. Why waste food and my effort for bringing them back and throw them into the bin? 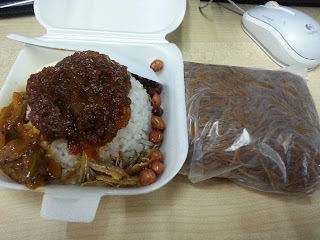 Before they gone expired, I brought them to the office as my lunch. There are cooking facilities in our office to prepare light meal. So I had instant Spaghetti for lunch yesterday. 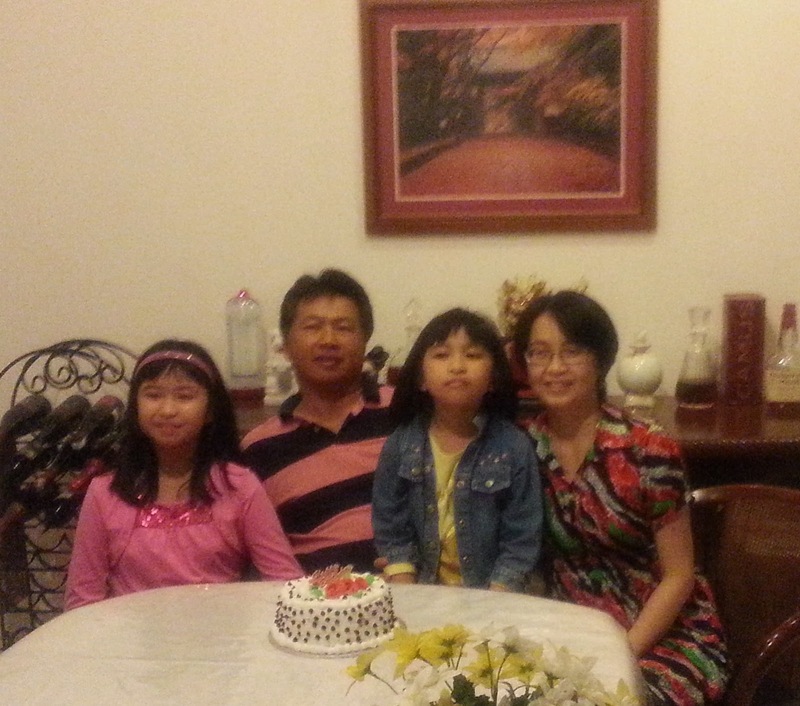 When we got back from work in the evening, Clet was in the kitchen preparing dinner. 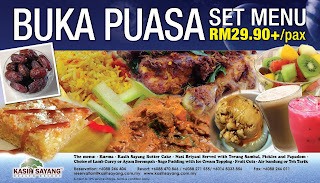 The lamb and curry chicken were dishes that we tapau from the parties we attended. 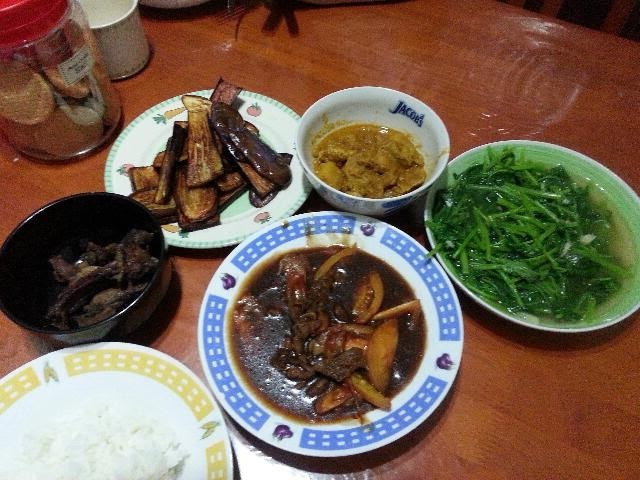 5 dishes in all for dinner. I have been absent from blogging and missed visiting friends' blogs lately. Time is the main factor. There are so much stuff in hand to work on and to get done with, weekends are as busy as week days as I have to man my Kids Fashion Shop. Without a shop assistant I can only open my shop for business during weekends when I am off from my full time job. The new staff that I mentioned in my last post only worked for one day and sms me the next day telling me that her teacher asked her back to school for an interview regarding further study, which is a total lie. Her mum told that she has started to work for a gaming outlet under the influence of her friend. Will be meeting 2 potential candidates this week, hope to find a reliable staff soon so that my shop business operation will be back to normal.